As a Financial Planner for more than 10 years, Anna focuses on the financial health of both business and individual clients. In addition to being a financial consultant for Synergy Financial, Anna is the Director of Accounting and Financial Services for Ellis & Associates, CPA’s PA. With the belief that integration of financial planning and tax planning is a winning strategy for clients Anna provides clients with a full range of accounting, tax planning and financial planning services. As a CPA, Anna has extensive expertise in Healthcare practice management and services, accounting services design and implementation, and financial planning. She guides clients in the areas of: computer and accounting system design, business valuation, financial planning and budgeting, and general business consulting. In the accounting field since 1982, Anna gives frequent seminars and workshops on accounting and tax topics. Prior to becoming a partner with Ellis & Associates, Anna was with a large Baltimore public accounting firm and Columbia-Freestate Health Systems (known today as Carefirst Blue Cross). 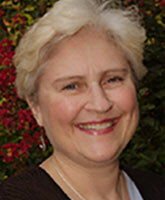 Anna joined Jim Ellis and Ellis & Associates in 1988. Anna is married to Harry, owner of the computer consulting company Midlantic Data Professionals, Anna has a grown son, Eric. She enjoys gardening, playing with her two dogs, working with animal rescue, hiking, birding, and is an avid reader. Born in Perrysburg, Ohio, Anna has lived in Virginia and North Carolina before settling in Baltimore in 1984. She currently resides in Clarksville. Anna is a graduate of Old Dominion University. She is a member of the American Institute of Certified Public Accountants, the MD Association of Certified Public Accountants and the Maryland Medical Group Management Association. She is also a member of the MACPA Financial Planning committee.